Developer Quote: "Draw on a 3-D spinning easter egg." This may be your last chance to play with egg decoration for Easter day. Beautiful color is always an eye-opener, so watching the colorful designs come out of Egg A Sketch was a sure win for me. With this app, you get to spin the egg in order to draw beautiful spiral patterns in many dazzling colors. Hold the egg still to draw your egg masterpiece by hand so you can use your talent to create something really special. For an even better view of your artwork, rotate the egg in 3-D! At the top of your display are several buttons. The palette with pencil icon at the top of the screen allows drawing designs on the egg, while the palette with egg icon lets you change the base color of your egg. Tap the X button to clear all previous designs. Change the direction of the rotation by tapping the curved arrow icon. At the bottom of the display, additional buttons control the direction of your egg spin. Note that eggs can not be saved or e-mailed from within this app. However, the PRO version of Egg A Sketch (available for 99 cents) allows your hand designed eggs to be saved, copied and e-mailed. Therefore, basically this Easter egg app allows you to play with art creation and the spinning egg. If you really loved an egg design, you could always press the Power and Home buttons to save the picture and use editing software to cut out just the egg. 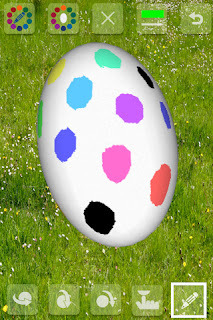 One good use for this app is that you could prepare your own design to dye your actual home-made eggs! COOL CONCLUSION: "Easter art work was never more colorful or high tech than with the spinning 3D Egg A Sketch!"